NLCS Game 4: A controversial call turns into a sloppy mess, and the Dodgers lose. The Chicago Cubs, scoreless in Games 2 and 3 of the National League Championship Series, unloaded on the hapless Dodgers in a 10-2 win in Game 4. Cubs starter John Lackey, 38, got the better of 20-year-old Julio Urias, writes Mark Whicker. Anthony Rizzo and Addison Russell keyed the Cubs’ attack. The Cubs reminded the Dodgers how quickly things can change, writes columnist Jeff Miller. Adrian Gonzalez criticized MLB’s replay system after he was called out at home plate in the second inning. MLB’s director of umpires says accusations of balks — like those lobbied toward Clayton Kershaw and Urias — come with the territory. Clayton Kershaw will start Games 2, Rich Hill Game 3, of NLCS. CHICAGO — Clayton Kershaw will start Game 2 of the National League Championship Series for the Dodgers on Sunday, and Rich Hill will start Game 3 on Tuesday in Los Angeles, Dodgers manager Dave Roberts announced Saturday. “It’s not complicated in the sense that if he feels good, it’s a no-brainer,” Roberts said of Kershaw. “I feel fine. I feel good. I feel excited,” Kershaw said. NLDS Game 5: Dodgers pull out all the stops, advance to NLCS with 4-3 win. WASHINGTON, D.C. — What a rush. 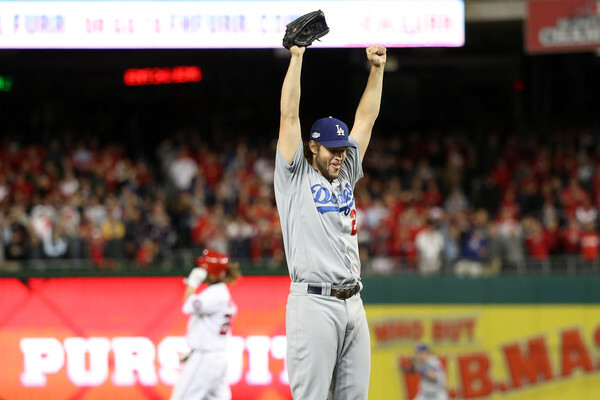 Clayton Kershaw‘s adrenaline got him through the final two outs, after Kenley Jansen recorded the seven before that, after Julio Urias became the youngest pitcher ever to win a postseason game, after the Dodgers overcame Max Scherzer at his peak. Four hours and 32 minutes after it all began, the Dodgers were in the National League Championship Series with a 4-3 win. Read the full game story here. The box score is here. The photo gallery is here. Kershaw had no idea the final inning would unfold the way it did. His teammates appreciated his heroics, writes columnist Mark Whicker. Now, Kenta Maeda is in position to start Game 1 of the NLCS. 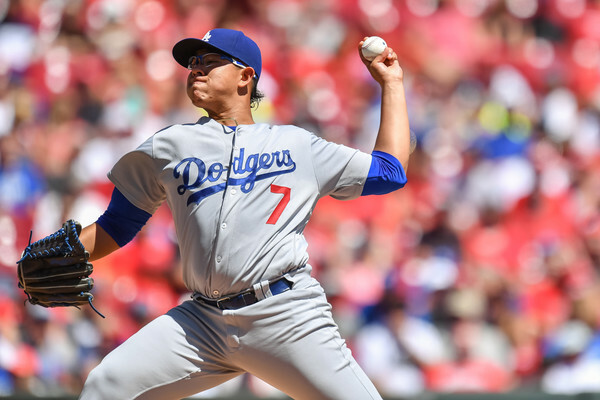 A brief pregame note on Rich Hill and Julio Urias. WASHINGTON, D.C. — It probably goes without saying that Dodgers aren’t looking for starting pitcher Rich Hill to pace himself tonight. Lose the game, and their season is over. Dodgers-Nationals NLDS Game 2 postponed due to rain. 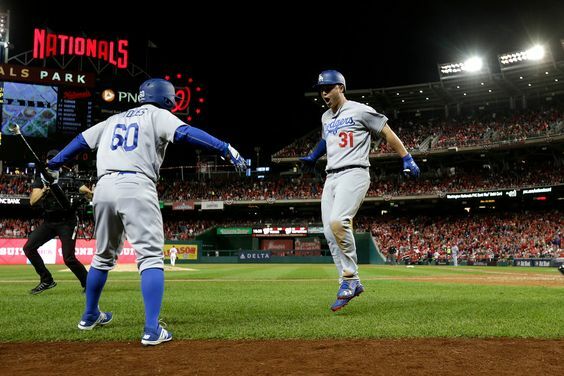 WASHINGTON, D.C. — Game 2 between the Dodgers and Washington Nationals has been postponed until 10 a.m. Pacific Time Sunday. The rest of the series schedule remains intact. But because Rich Hill cannot come back to pitch a potential winner-take-all Game 5 on regular rest Thursday, the Dodgers would prefer to save Clayton Kershaw for that spot. That means Kershaw won’t pitch Tuesday’s Game 4, and the start will go to rookie Julio Urias instead.